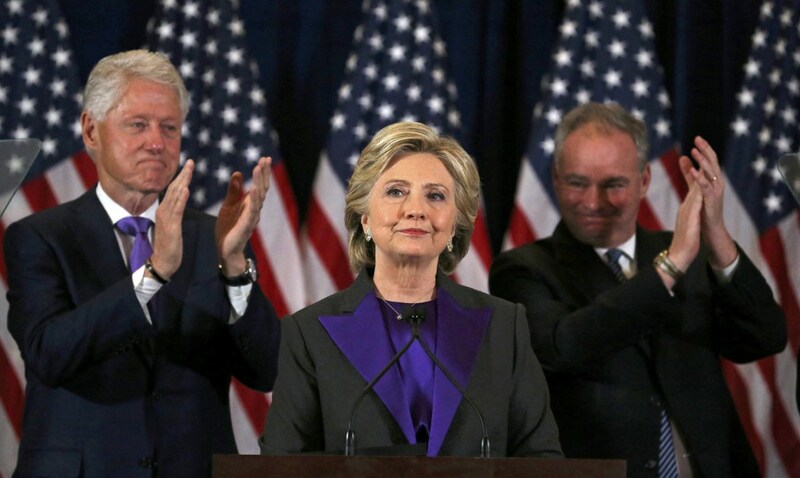 In a gracious turn to her opponent — and a nod to women and girls who saw her as a role model — Hillary Clinton urged Americans on Wednesday not to give up on the values they embraced in her. 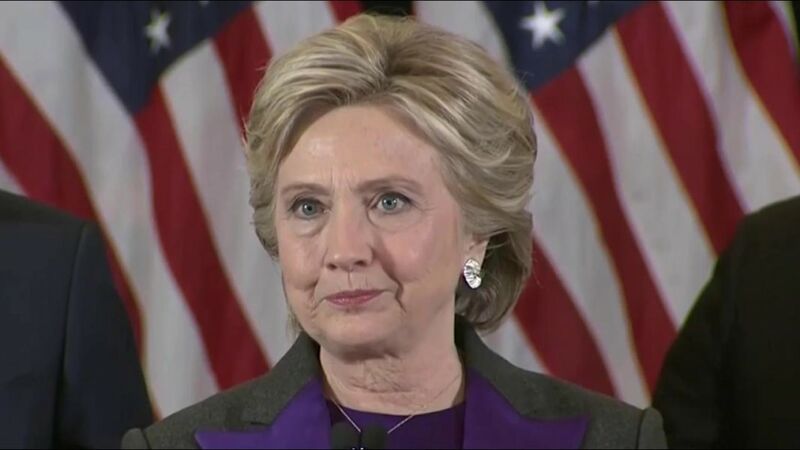 "I know how disappointed you feel, because I feel it, too," Clinton told supporters in her first public remarks since her stunning defeat. 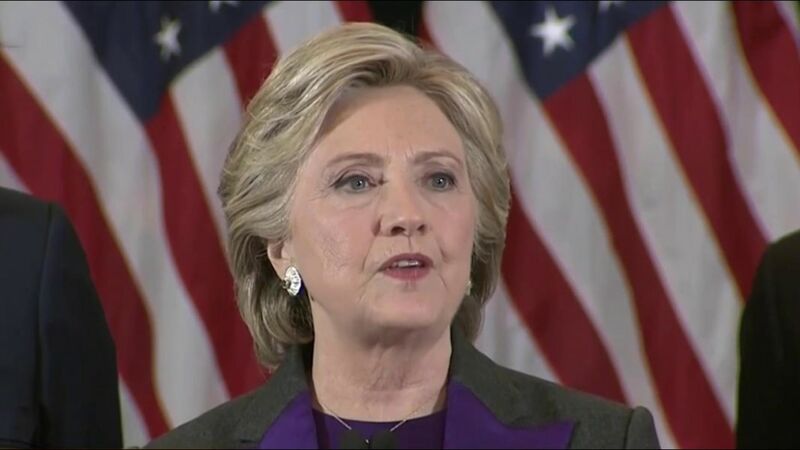 "This is painful and it will be for a long time, but I want you to remember this: Our campaign was never about one person or even one election. It was about the country we love and building an America that's hopeful, inclusive, and big-hearted." "I still believe in America," Clinton added, "and I always will." The Democratic nominee had called Republican rival Donald Trump in the wee hours of Wednesday morning to concede after the real estate mogul pulled off his shocking upset — capping off an election where all conventions were seemingly thrown to the wayside. Clinton had sparred with her rival for a year, calling him "dangerously incoherent" and "temperamentally unfit" to hold office. But in her speech Wednesday, she asked Americans to give Trump a chance as president. "I hope that he will be a successful president for all Americans," she said. "We must accept this result and look to the future. We owe him an open mind and a chance to lead." After conceding overnight, Clinton quietly exited the Manhattan convention center where her lavish Election Night party was taking place. Singers Katy Perry, Lady Gaga and Cher had been in attendance, ready to perform if Clinton clinched a win. 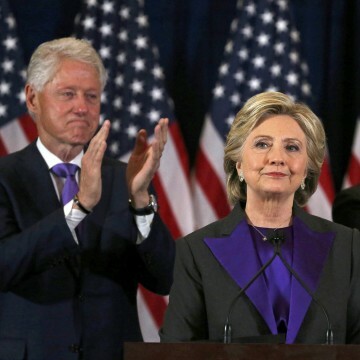 Those in the room Wednesday as she spoke included longtime Clinton friends and former diplomats, as well as her top aide Huma Abedin and other senior staff. Her husband, former President Bill Clinton, was also there. The audience gave her a standing ovation. Some had tears in their eyes. 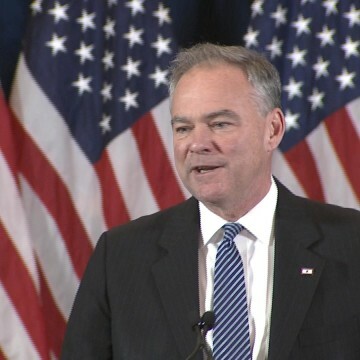 Her running mate, Virginia Sen. Tim Kaine, introduced her by saying how proud of her he was: "She has been and is a great history-maker." "We know she would have made history as a president," he added. In a jab to their opponent, who repeatedly called the election "rigged" during his campaign, Kaine also said: "Nobody had to wonder about Hillary Clinton, whether she would accept an outcome of an election in our beautiful democracy." By nearly every indication, Clinton looked poised for a win. 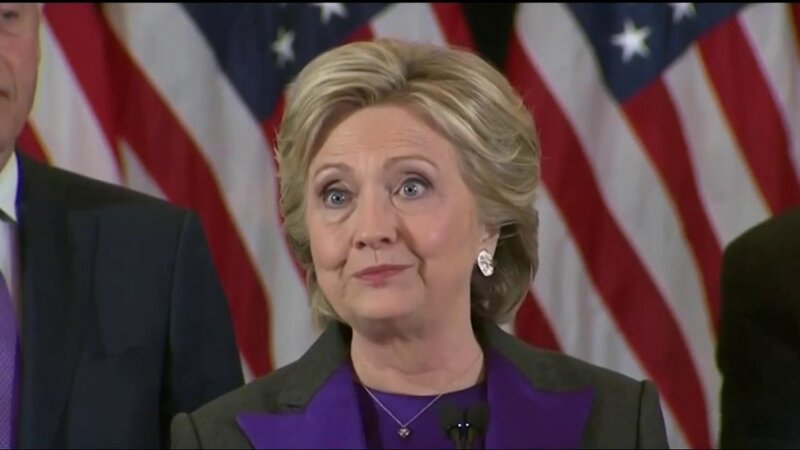 Even after an 11th-hour bombshell from FBI Director James Comey on the email controversy that has dogged her campaign, polls in the days leading up to the election showed the former secretary of state ahead by 4 points. On Election Day, her emotional supporters had filled social media with photos of themselves bringing their daughters to their polls to vote for the first female presidential candidate. Many wore pantsuits to vote, emulating Clinton's signature style. Clinton thanked voters Wednesday and told them that they, too, will experience setbacks, but they shouldn't be discouraged. "This loss hurts, but never stop believing that fighting for what right is worth it," she said. "To all the women and especially the young women who put their faith in this campaign and in me, I want you to know that nothing has made me prouder than to be your champion." "And to all the little girls that are watching this, never doubt that you are valuable and powerful and deserving of every chance and opportunity in the world to pursue and achieve your own dreams," she said. "I know we still have not shattered that highest and hardest glass ceiling, but someday, someone will." President Barack Obama called Trump early Wednesday to congratulate him and invited him to a meeting at the White House on Thursday. He also called Clinton. In his first remarks since votes were counted, Obama said Wednesday that Clinton has "lived an extraordinary life of public service." "I'm proud of her. A lot of Americans look up to her," the president said. 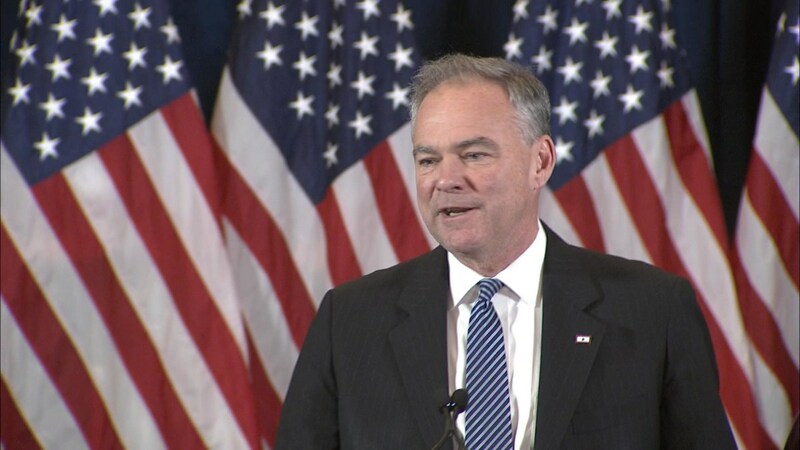 "Her candidacy and nomination was historic and sends a message."